Chris started his talk by sharing that he first discovered he could travel in time as a child, whilst in front of the wondrous invention that is the television. Sat in front of a glowing square box is where Chris stumbled across Bagpuss, the children’s television show which shifts from sepia to colour when Bagpuss wakes up. Chris credited this programme as a key inspiration for his current endeavours with Retronaut. 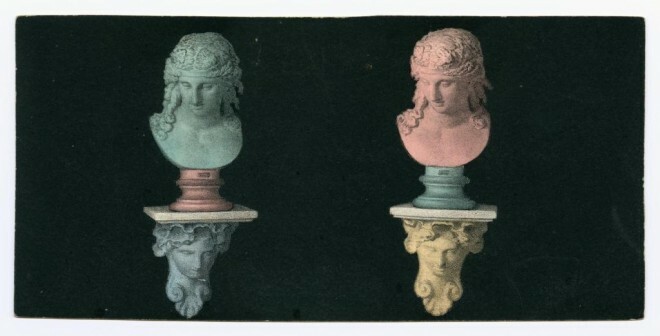 Bi-coloured stereocard, depicting the bust of Dionysus, by Jules Duboscq, c. 1852. From the Howarth-Loomes Collection at National Museums Scotland. Chris’s talk was accompanied by vivid images and it reminded me that I do sometimes forget that the past was in colour! It’s such a simple thing. A default way of thinking of the past is in black and white. The Photography: A Victorian Sensation exhibition has been running since June at the National Museum of Scotland and is filled with thousands of incredibly beautiful black and white images of the past. I’ve looked at many of these images and it’s easy to slip into thinking that the landscapes were colourless, and that people’s faces were different shades of grey. 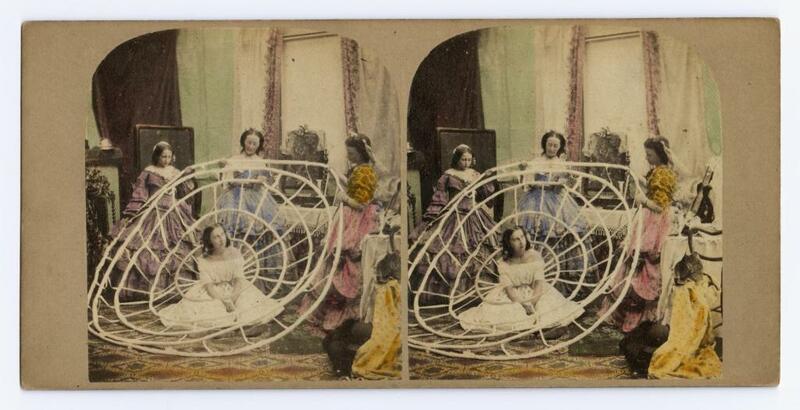 ‘Crinoline Made Useful’ stereocard depicting a woman being dressed in a crinoline, by an unknown photographer. From the Howarth-Loomes Collection at National Museums Scotland. However, as Chris highlighted when he discovered the ‘Crinoline’ series of images from Photography: A Victorian Sensation and wrote a feature about them on Retronaut, in among all of the images in this exhibition, there are a few wonderful colour ones. As I returned from the conference I couldn’t shake these thoughts of a colourful past from my head. 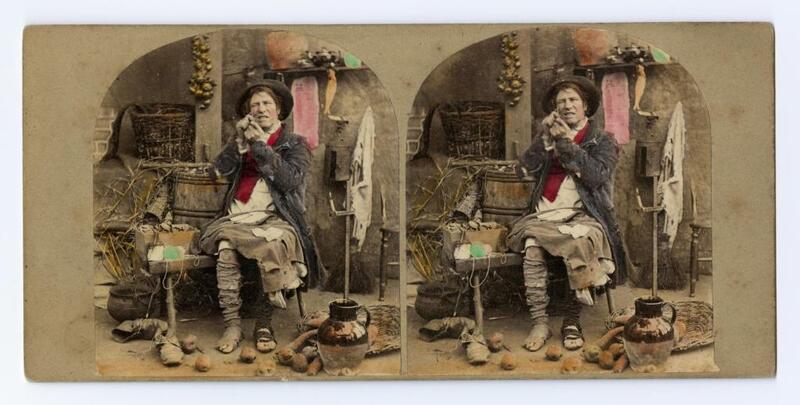 I decided to delve into the Victorian Sensation photography collections that we have online and explore these colour Victorian images a little more myself. Of course, there was no form of commercial colour photography available at that time, and instead various forms of painting, colouring and tinting were applied. 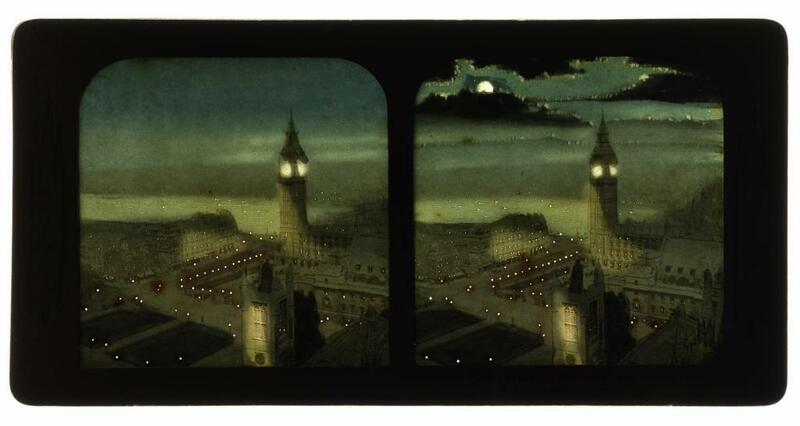 This French tissue stereocard depicts a London panorama towards St Paul’s, taken from above Parliament, by B. K., 1860s – 1870s. From the Howarth-Loomes Collection at National Museums Scotland. First I came across a series of dreamlike French tissue stereocards. In this series, the wispy soft colour images seem to sit somewhere between a painting and a photograph. The scenes depict London as a magical place, with glowing, starlit skies. It’s a peaceful London at night, devoid of people and cars and recognisable simply from the familiar buildings. 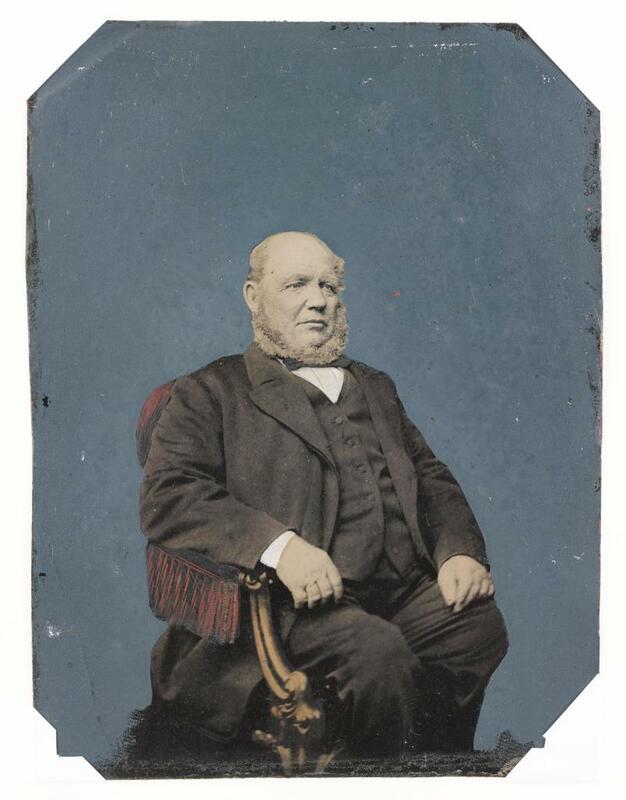 This style of photograph was introduced in the 1860s and printed on extremely thin paper, backed with another piece on which the outline of the photograph was painted in various colours. 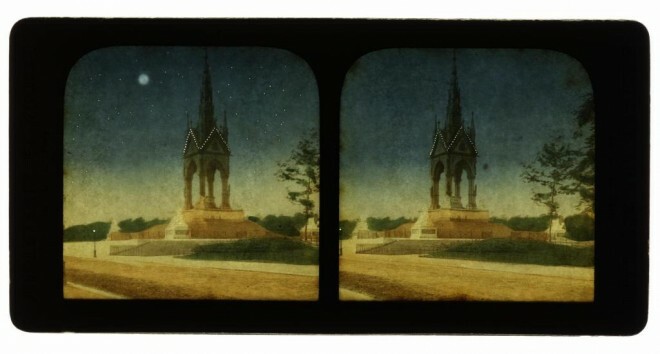 A further embellishment was to pin-prick features, which show as sharp points of light when seen back-lit in the stereoscope. So in fact, it is part painting and part photograph. French tissue stereocard depicting the Albert Memorial in London, taken by Leon & Levy, Paris, 1860s – 1870s. From the Howarth-Loomes Collection at National Museums Scotland. The next set of colour images I discovered were also stereocards, but this series by Michael Burr have a very different feel to them. It was ‘Patent Pulpit: Seven minutes to one!’ which first caught my attention. 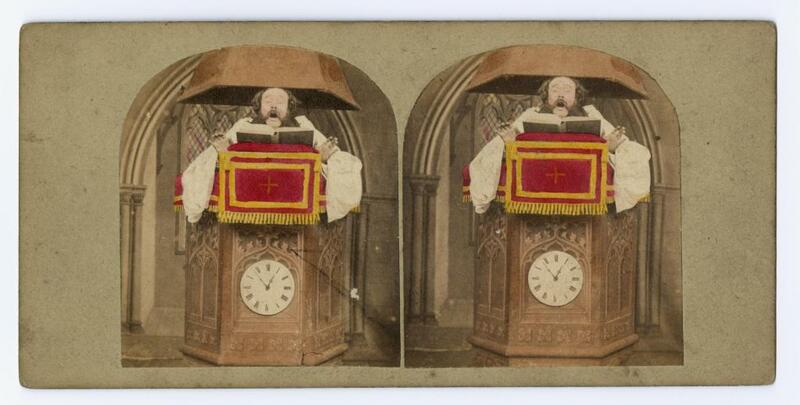 I couldn’t tell if the priest featured is in shock, in pain, about to sing or falling asleep. Stereocard depicting ‘Patent Pulpit: Seven minutes to one!’ by Michael Burr, 1862. From the Howarth-Loomes Collection at National Museums Scotland. The colour in Burr’s images, rather than making the scenes seem more real, makes them more surreal. With only certain elements picked out in colour, they take on a different life, transporting you not just to a place between the ‘black and white’ past and ‘colourful’ present, but to a more fantastical region somewhere in-between time; a place where this troubled single fellow below is flushed with pink cheeks, despite the rest of his skin remaining grey. 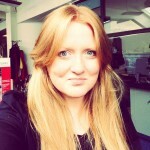 The shock of red and pink scream out and distract you from the ragged trousers and tired boots. Stereocard depicting ‘The Troubles of Single Life’ by Michael Burr, 1865. From the Howarth-Loomes Collection at National Museums Scotland. From the troubles of one, to the happiest days of another; the next images I discovered were a series by James Elliot. 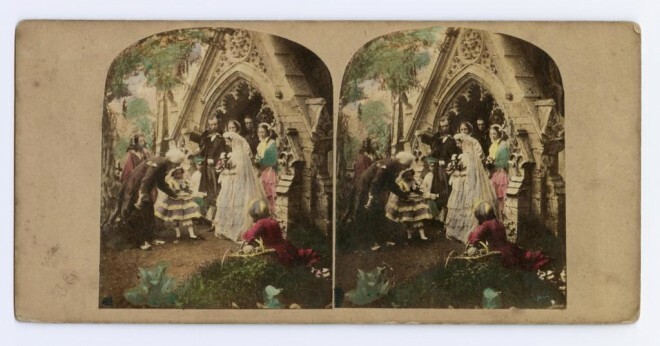 Coloured stereocard entitled ‘Happiest Day of my Life’ depicting newlyweds in a church doorway, by James Elliott, London. From the Howarth-Loomes Collection at National Museums Scotland. His technique of highlighting key details with colour is similar to Burr’s, but his focus is different. The camera has zoomed out to take in a whole host of scenes – from newlyweds in a church doorway, to a re-enactment of Joan of Arc, riding a white horse and fighting several men. 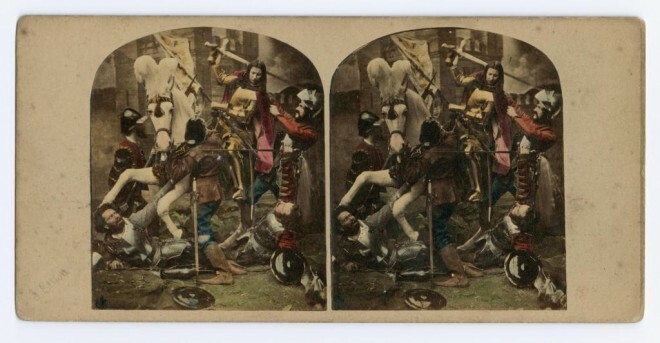 Coloured stereocard entitled ‘Joan of Arc taken Prisoner’ depicting a re-enactment of Joan of Arc on a white horse fighting several men, by James Elliott, London. From the Howarth-Loomes Collection at National Museums Scotland. The more I searched, the more intriguing images I found. These images by Martin Laroche show a Catholic priest caught eating meat on a fast day. I love the facial expression and the bold green screen that frames him perfectly. 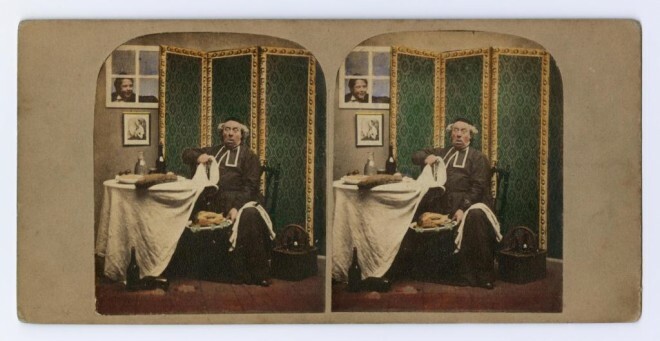 Stereocard depicting a Catholic priest caught eating meat on a fast day, by Martin Laroche, c. 1856. From the Howarth-Loomes Collection at National Museums Scotland. This image by Alfred Silvester depicts a rarely photographed bedtime scene. Again, the blue swathes of curtain frame the white clothed figures perfectly to create a focus on the central scene. 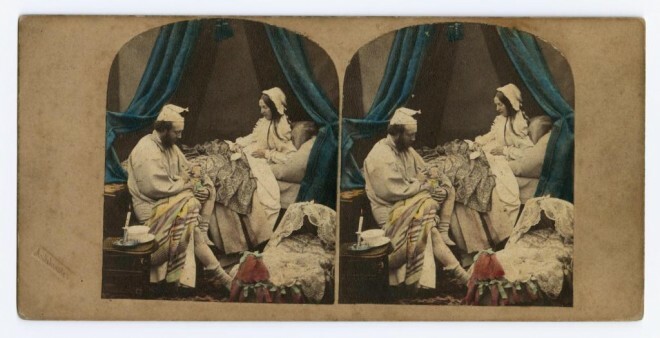 Stereocard depicting the coloured comic ‘Three o’clock in the Morning’ by Alfred Silvester, c. 1850 -1860. From the Howarth-Loomes Collection at National Museums Scotland. I love the bright red and gold in this image, which shows a man wearing a military uniform. It was taken by Antoine Claudet, who opened his studio in 1841 and was pioneering the colouring of daguerreotypes at this time. 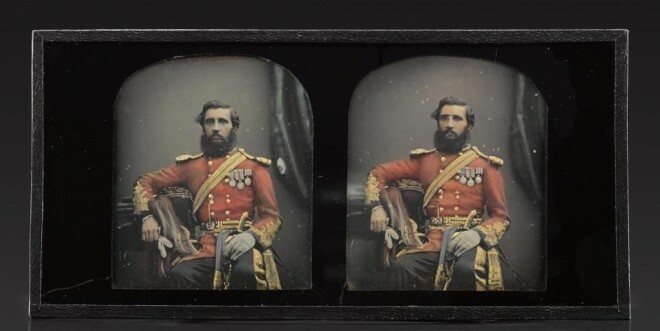 Stereo daguerreotype depicting a man wearing a red military uniform adorned with medals, suggesting the rank of Cavalry Major, hand-coloured, by Antoine Claudet, 1855 – 1858. From the Howarth-Loomes Collection at National Museums Scotland. The final set of images I found were studio tintypes (a single, positive image on a tinned or enamelled iron support) and they show more traditional portrait images where almost all of the colour has been added to the scene. 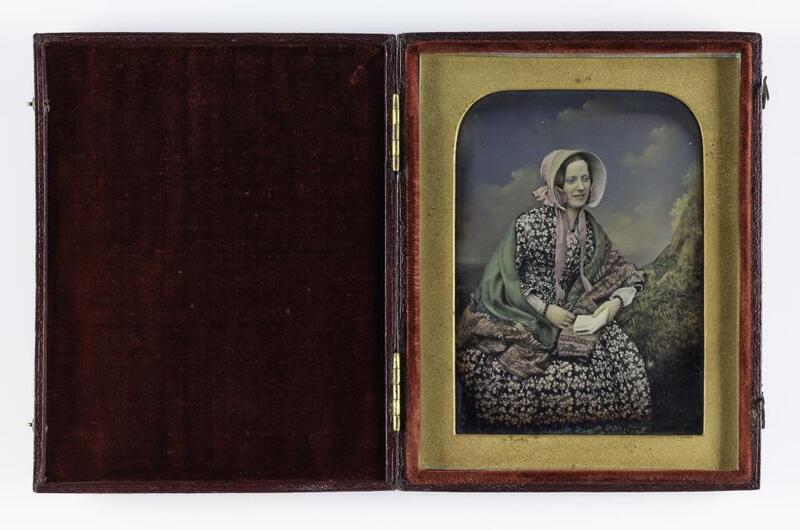 1/6 plate tinted daguerreotype, depicting a seated young woman wearing a bonnet, shawl and flower print dress, mounted and cased, by Beard’s Photographic Institutions of London and Liverpool, 1852 – 1854. From the Howarth-Loomes Collection at National Museums Scotland. In this second image of a seated man, the added colour makes him appear almost statue-like, the grey skin and beard emphasised against the rich blue background. I really like this effect. Whole plate heavily tinted tintype, depicting a seated man, by an unknown photographer, 1870s – 1890s. From the Howarth-Loomes Collection at National Museums Scotland. 1907 Lumière Brothers manufacture the Autochrome plate; this becomes the first commercially successful colour photography product. 1935 Introduction of Kodachrome multi-layered colour reversal film by Eastman Kodak. 1963 Polaroid introduces instant colour film and cameras. I would recommend a visit to the #VictorianSensation exhibition before it finishes on 22 November 2015. In addition to telling the story of the early years of photography, it offers a window into the social history of the period; people and faces that give a glimpse into our past – which is very colourful indeed.